Adult female polyphagous shothole borer. California have died. No effective management tools are available. More information is available on the UC IPM web site. Polyphagous shot hole borer. Like the walnut twig beetle, this tiny borer, Euwallacea sp., spreads a fungal pathogen (in this case a Fusarium species) as it bores into trees. The relationship between the beetle and fungus is a symbiotic one with the beetle feeding on the fungus as it grows through the vascular system of trees. 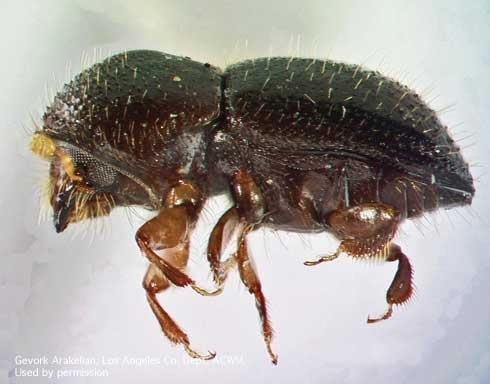 This beetle and pathogen have a broad host range and many trees have been affected including avocados, boxelder, coast live oak, liquidambar, and sycamore. Initial finds were in the Los Angeles area in 2012, but the beetle and disease have now been found as far north as Santa Cruz. 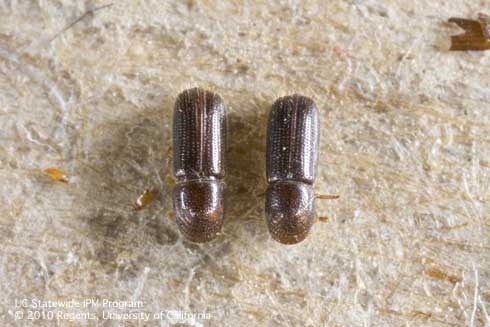 For more information on this pest, infestation zones, and ways you can help limit the spread, see the University of California Polyphagous Shot Hole Borer web site and the Center for Invasive Species Research.